On January 24th GE Power at EDC organized the Industry and Science Summit to celebrate the 1st anniversary of the Gas Turbine Center. The event also coincided with the 10th anniversary of GE Power’s presence at EDC, and 25 years of GE in Poland. The conference gathered many distinguished guests from GE, its customers and the science world. After the short introduction made by Witold Wiśniowski (Director of the Institute of Aviation) and Marian Lubieniecki (EDC Site Leader, Chairman of the Management Board of GE Company Polska Sp. z o.o. ), Michał Małecki (Executive Manager, Gas Turbine Center, GE Power) invited all guests to participate in discussion panels and give speeches on the energy market situation in Poland and the whole Europe. 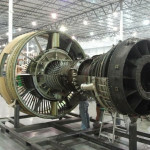 GE officials were speaking about GE’s reply to future energy demands and customers’ expectations connected to it, GE presence at European power market, and innovative digital solutions supporting gas and steam turbines exploitation. Representatives of science world focused mainly on cooperation between industry and universities, Polish Power Market status and future perspectives, and challenges for the world of science in the matter of developing energy conversion and accumulation methods. All guests agreed that there is a place for gas turbines as an energy source for Poland, and GE can win the market with its innovative products, modern solutions and customer-friendly service. 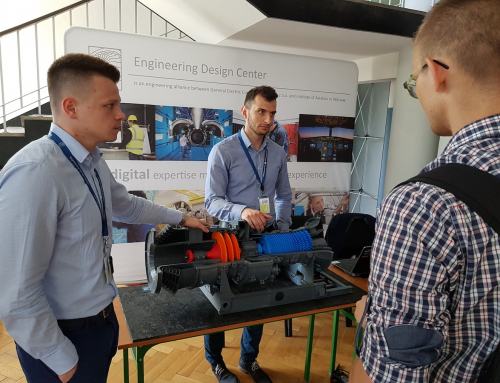 The celebrations continued on January 25th, when GE officials visited Warsaw University of Technology to meet with the students and talk about the career perspectives in engineering. In the evening the whole Gas Turbine Center team gathered for the all-hands meeting to share knowledge about the global GE Power situation. It included the annual Engineering Recognition Day gala, during which engineering awards for the most outstanding achievements were handed. Congratulations to all the winners! What’s more, on January 26th Gas Turbine Center managers also attended the meeting with Mateusz Morawiecki (Polish Deputy Prime Minister, Minister of Finance and Development) and John G. Rice (Vice Chairman of GE) regarding the official signing of “The Memorandum of Understanding” between the Polish Government and GE.